This may be the most talked about film of 2014. Sony couldn't have begged for better publicity or come up with a better marketing plan than all of the controversy and hacking caused by this film. Sometimes truth is stranger than fiction. I saw this movie in a sold out theater full of people you would never expect to see at a Franco/Rogen flick. This movie has become a cultural icon that everyone wants to see. In fact, this was more of an event than just seeing a movie. The crowd was totally into it 30 minutes before the film started. The theater was playing patriotic music, strangers were talking to each other in a "Go 'merica" way, and the mood was basically a huge F.U. to anyone that didn't want us to see this movie. As for the movie, it's okay. It has a lot of funny moments and the story is pretty good. 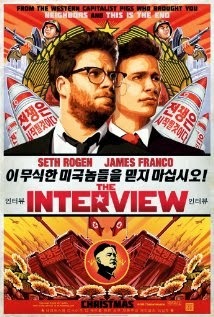 It's a typical Franco/Rogen flick with lots of crude body-part humor and other assorted raunchy jokes. It's not as good as THIS IS THE END, but it isn't a horrible mess either. If it were a typical release it would probably make about $50 Million then fade off into DVD land never to be thought of again, but because of the controversy this may end up being one of the highest grossing films of 2014. On it's surface I would say it's worth seeing on DVD or streaming, (which is available now), and not something worth spending your money on in a theater, but there is more to this film than just the quality of the movie. This has become a statement film for many different reasons, so if you can find a ticket, I say go enjoy this in a theater and experience the event of the movie even if the movie isn't that great.